If you’re like me, you may still be uncertain on your exact NYE plans but that doesn’t mean you need to leave your New Years style and beauty hanging! I am a bit embarrassed to admit this but each new years regardless of whether I am staying in for a night of movies or I’m heading out for a big night of dancing, I always have my NYE outfit and look decided weeks in advance. Yes, basically what I am saying is even on the years when J & I have just stayed at home watching movies (one year we even just watched cartoons) I am still always decked out in sparkle, shine, glitter and am styled to the nines. I suppose I’ve always figured that regardless of what you’re doing, why not ring the new year in in style? drawn towards subtle pretty pink lips paired with vamped up smokey eyes. rest! Metallic pieces act as neutrals and can pair stylishly with anything! keep this look from being too shockingly sparkly. For more on NYE Style & Beauty visit The Hunt! 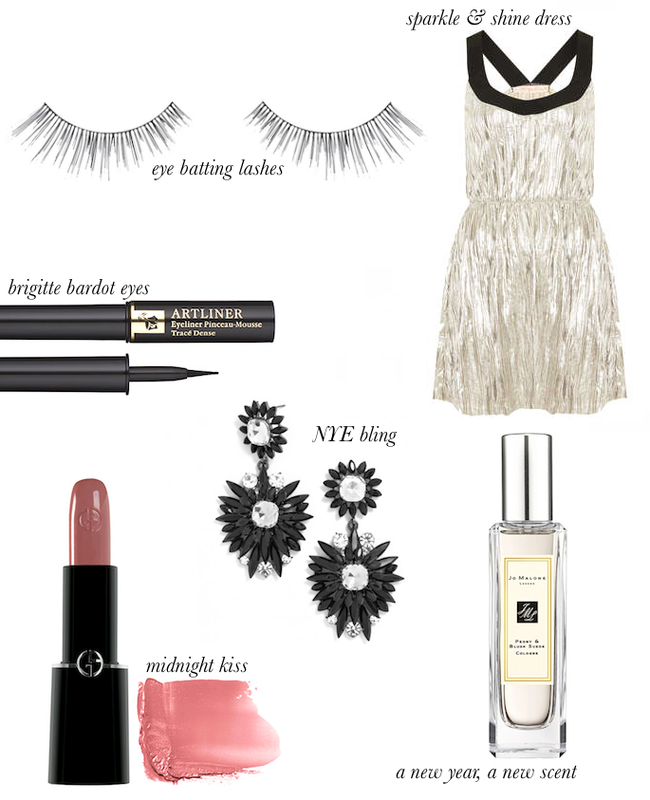 I just recently was invited to share my NYE Style & Beauty tips so join me on The Hunt & let’s get glamourous together! Gorgeous dress! I usually try falsies for NYE, I need to pick up some for this year! Lovely, the dress is perfect for NYE! Have a wonderful night! I love this plan! whether you are home or out you should ring in the new year with sparkle! I love this eyeliner! I may have to buy one as an after christmas gift to me! I love it! I haven't been out on NYE in years! I'll be working but wishing I was somewhere fabulous and wearing something fabulous to match.